Glycogen is a form of carbohydrate which is stored in the muscles and liver for energy. The University of Missouri Extension states that glycogen is very important because it is the body's main form of fuel for long-term energy. When a person engages in an endurance sport or needs energy for long periods of time, the body continually uses the glycogen to fuel that activity. Endurance athletes often have a special diet so that they can store extra glycogen in their muscles and perform their sports better. Certain foods are better than others for building up glycogen in the body. 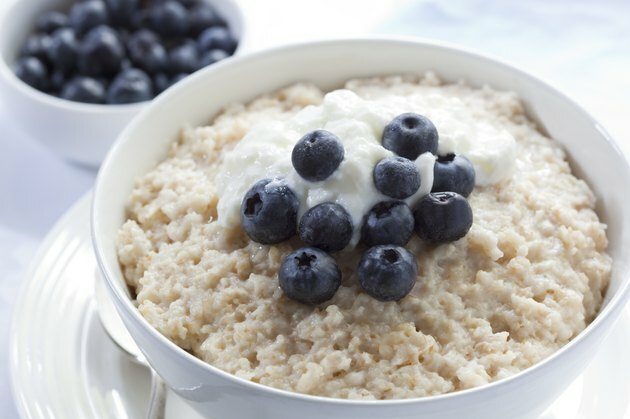 The UM Extension explains that foods which are high in carbohydrates, like oatmeal, help store glycogen in the body so that an athlete can train his hardest and perform his best. Additionally, the type of carbohydrate in oatmeal is important. Dr. Bill Sears, pediatrician and professor of pediatrics at the University of California at Irvine states that oatmeal is one of the best foods to eat to build glycogen because it is a complex carbohydrate, which means it has the fiber, vitamins and minerals that it was grown with. Eating oatmeal with milk and raisins can increase glycogen stores even more because milk and raisins also have carbohydrates. Storing glycogen is actually easier when a more simple and healthy beverage is consumed: juice. Juice is actually beneficial to help store and replace glycogen stores before and after exercise, respectively. 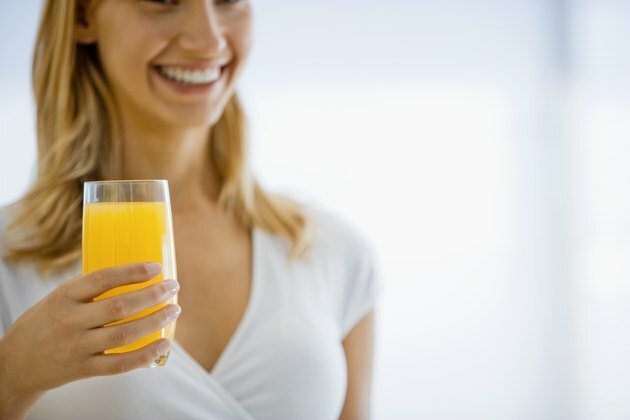 Dr. Bill Sears states that instead of getting fruit juice with added sweeteners, it is important to choose 100 percent juice. Juice has a simple carbohydrate called fructose that builds glycogen stores quickly, so it's best for just before or just after an event. 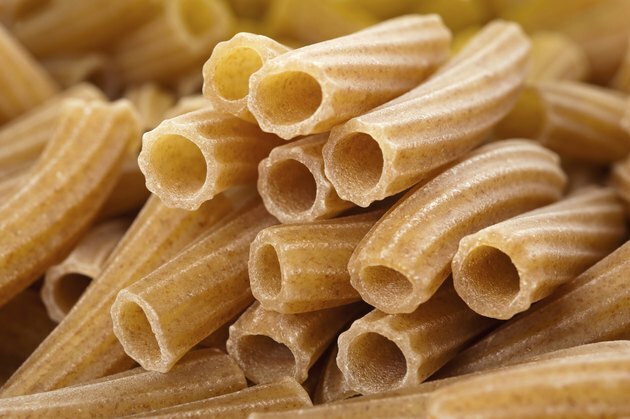 Whole wheat pasta is an excellent food to eat for increasing glycogen storage in the body. The University of Missouri Extension explains that eating refined carbohydrates like white pasta can actually lead to hypoglycemia, making an athlete tired and weak. Complex carbohydrates, like whole wheat pasta, have more vitamins, minerals and fiber than refined carbohydrates and they raise blood sugar levels at a slower rate. Therefore, the UM Extension recommends eating a complex carbohydrate like whole wheat pasta the day before an event and one to two hours after exercising to replace glycogen stores. The benefit of yogurt for sports training is that it contains both carbohydrates and protein. In addition to having a carbohydrate called lactose, which builds up glycogen, yogurt also has protein and calcium. 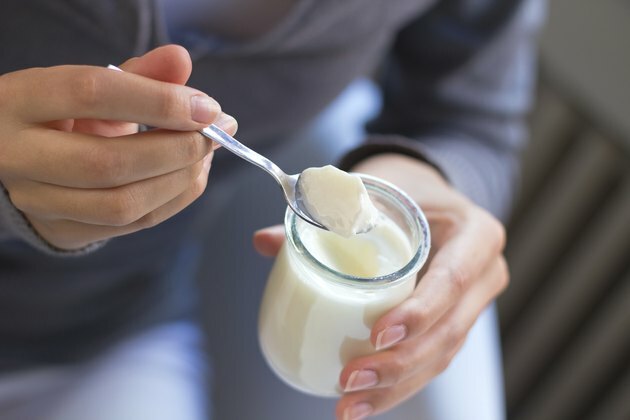 Dr. Bill Sears, at the AskDrSears website, states that eating fat before an event can interfere with training, so it's best to choose a low fat yogurt to build glycogen.